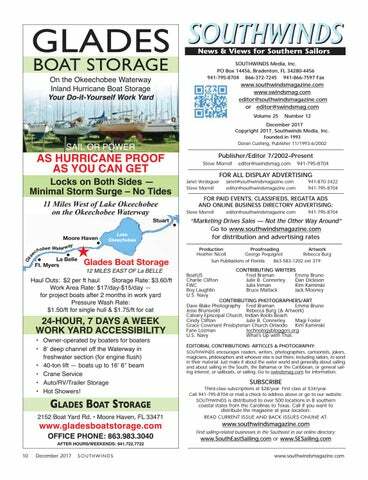 24-HOUR, 7 DAYS A WEEK WORK YARD ACCESSIBILITY • Owner-operated by boaters for boaters • 8’ deep channel off the Waterway in freshwater section (for engine flush) • 40-ton lift — boats up to 16’ 6” beam • Crane Service • Auto/RV/Trailer Storage • Hot Showers! CONTRIBUTING PHOTOGRAPHERS/ART Dave Blake Photography Fred Braman Emma Bruno Jesse Brunsvold Rebecca Burg (& Artwork) Calvary Episcopal Church, Indian Rocks Beach Cindy Clifton Julie B. Connerley Magi Foster Grace Covenant Presbyterian Church Orlando Kim Kaminski Fane Lozman technologybloggers.org U.S. Navy What’s Up with That. 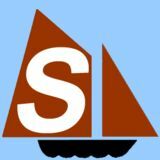 EDITORIAL CONTRIBUTIONS: ARTICLES & PHOTOGRAPHY: SOUTHWINDS encourages readers, writers, photographers, cartoonists, jokers, magicians, philosophers and whoever else is out there, including sailors, to send in their material. Just make it about the water world and generally about sailing and about sailing in the South, the Bahamas or the Caribbean, or general sailing interest, or sailboats, or sailing. Go to swindsmag.com for information.